New orders for Durable goods decreased 4% in June making this the biggest drop since August 2014. 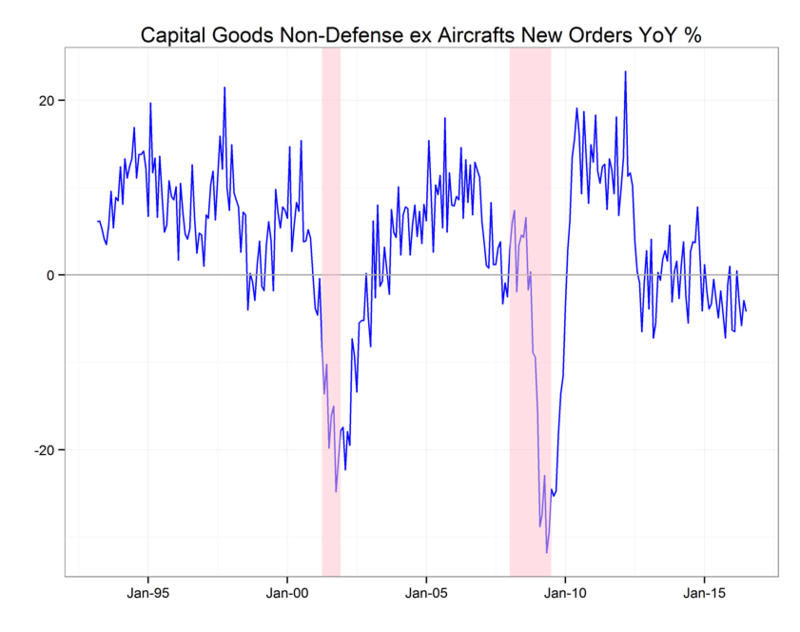 The core measure of new orders for non-defense capital goods excluding aircrafts is up 0.2% in June but still down -3.7% YoY. While the overall new orders decline of 4% looks bad, we believe it is not as meaningful as a measure of manufacturing activity. The reported decline is attributable to a -59% change in commercial aircraft orders. The core capital goods number is used by economists as sign of business investment activity. It has been negative since Dec 2015 but the pace of decline has been slowing. This measure tracks private fixed non-residential investment, a measure of business investment which declined for two consecutive quarters (Q4 2015 & Q1 2016) for the first time since 2009. It can be seen as leading indicator, but revisions & volatility may make it less reliable. These numbers don’t fully take into account the uncertainty and the strengthening dollar post-Brexit and we expect next month’s release to reflect further deterioration in business investment activity. Since 2014, there has been ongoing weakness in manufacturing sector and US PMIs, led by the domestic energy sector & a strong US $. We have been seeing gradual recovery in 2016- the July Markit Flash Manufacturing PMI released last week was highest since October 2015. But, we expect headwinds to remain from political & global markets uncertainty.